Matt Shlonsky loved Washington, DC. 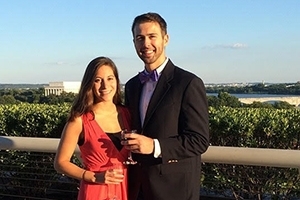 Since arriving at American University in 2010, Matt had embraced his adopted city, attending historical events, concerts, and other local activities across the district. After his graduation from the School of International Service in May 2014, Matt elected to remain in Washington, starting a career in business communications and consulting. Matt continued to give back to the School of International Service as a generous volunteer and a donor. Matt was already on his way to a successful career with Deloitte and other exciting pursuits outside of his work. Our hearts are broken to report that Matt’s future of unlimited possibilities ended tragically on August 15, 2015, when he fell victim to gun violence in Washington. Matt left behind a loving family, many hundreds of loyal friends, and a remarkable legacy of caring and kindness that betrayed his 23 years. I had the opportunity to spend a brief time with Matt only a few weeks before his tragic death. He was, as he often did, helping to mentor young people. During his college years in Washington and as a high school student in his native Cleveland, he worked at local synagogues as a tutor and mentor to young students, and he volunteered to mentor other youth whenever possible. As many of you know, Matt’s death was the second loss American University suffered this summer to terrible violence in Washington. School of Public Affairs recent graduate Kevin Sutherland was killed while traveling on a metro train on July 4. I am unable to find words to adequately describe the loss of Matt and Kevin, two very bright lights with wonderful futures ahead of them, and the many dozens of other young men and women who have died in the District of Columbia this year. In the shadow of this tremendous sadness, the School of International Service hopes to pursue some good. With the blessing of his beloved family, and in collaboration with Matt’s dearest friends, many of whom are alumni of American University, I have established the School of International Service Matthew C. Shlonsky Memorial Fund for the District of Columbia. The Fund will support SIS faculty and students who wish to draw on their international affairs research to address challenges facing the District of Columbia. As an international affairs school, where faculty conduct research on the great challenges of our time around the world and train students to serve, SIS faculty and students are able to apply lessons from their research abroad to addressing critical challenges in Washington, from public health to the environment and many other areas. These faculty and student collaborations offer a meaningful opportunity to conduct cutting-edge scholarship locally. Washington is our host city, and its problems are our problems, and we have an obligation to address them. Moreover, Washington can serve as a local laboratory for students, many of whom are unable to travel abroad but can undertake meaningful research here. Lastly, we feel strongly that institutions of higher education must serve their communities – and this is especially true for a school founded on the premise of service. To get us started on research that allows our faculty and students to apply their knowledge to challenges in the District, I ask the American University community to contribute to the School of International Service Matthew C. Shlonsky Memorial Fund for the District of Columbia. While it is a special way to honor and remember Matt, it is also an important way to give back to the District of Columbia, and the many gifts it has given all of us who have had an opportunity to spend time here and learn from the people, history, and wonder of our nation’s capital. Thank you for your support, and please continue to keep Matt’s family and friends in your thoughts. Matt Shlonsky’s closest friends and alumni of American University will host a fundraiser for the Shlonsky Fund on Wednesday, October 21, at Right Proper Brewing Company in Washington, DC. Learn more about Matt Shlonsky. Contribute to the School of International Service Matthew C. Shlonsky Memorial Fund for the District of Columbia.